It’s day four in Lanzarote and I’m having to ease things back a little to ensure I can continue to walk up and down the stairs to our apartment. The quad killer was a run along the coastal trail to Playa Quemada a reasonable effort in itself given my recent lack of run training. I was feeling good and it’s a lovely trail so once down there the first challenge was to run up to a small plaque on the hill side. Having done this the second challenge was to run up a steep hill to a radio mast. From there you could see an old wall at the top of the next hill obviously I had to go there too. Whilst 2:15 of comfortably paced running was a bit of a step up it was coming down from those steep hills that really did my legs in. 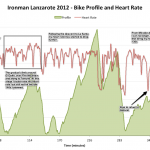 Throw in a couple of big rides at a solid pace round the island and I’m not too shocked by the pain in the quads. Apart from getting myself ready to race an Ironman I also want to use my time here to get back to a full training routine so there’s no rest today. I’m easing back and keeping the intensity way down, but there’s a run and a bike to be done. Rather than prattle on about how it’s nice to be in the warm again or tot up the hours of training I’m managing I’ve a few thoughts on my return to fitness (again). The good and bad of a high heart rate. After five weeks of leisurely training the biggest difference at the moment is the ease with which I can raise my heart rate. It really highlights the impact a large training volume has on me. Most of the year I find a lot of my training takes place around the 130bpm mark. More than that requires interval work or some decent hills. The last two weeks I’ve seen the 170s a few times and even the 180s (I’d forgotten I could go there). The good is I’m able to make myself do harder work more easily. An overall lack of fatigue is giving me the room to push a little bit harder. My general riding is at a higher intensity than it has been and consistently so. 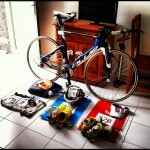 It’s affirmative in a sense to see how I can ride at around my typical race pace for long periods of time. On the other hand whilst I am riding close to that race pace I’m also doing so at a higher average heart rate than I’d normally expect. Whilst I can put this down in part to a lack of suppression from fatigue I also see it as a clear sign that my fitness isn’t there yet. My capacity to work is there, I can ride hard, but the cost to my metabolic and aerobic systems is higher than normal. I need more time to build up the overall fitness that allows me to support this training load without such relatively high heart rates. Nutrition and metabolism. Along similar lines I am much more carb reliant during training than I have been. I put this down to the higher work rate and the slightly lower levels of conditioning meaning my body is utilising a bit more carbs and a bit less fat than it typically has on my long rides. Again there’s fitness adaptations to be made both improving fat utilisation and improving fitness such that the current level of work becomes a lower relative intensity. As the relative intensity drops I would expect to be able to produce the same absolute power for a greater proportion of fat than carbs. Being aware of this I can sustain a stronger work load by carefully feeding in enough carb rich food on the bike to keep me going. As I’ve experienced in races the important thing is to keep the level just enough to sustain the workload. When the balance is right I can hold the intensity indefinitely (near enough for the purposes of riding). Taking too long a gap between food at the moment results in a more eratic ride with lulls in performance. The other lesson learnt in my first few days here is I can’t drink fizzy drinks. I’ve known this enough to never touch coke during a race, but a large bottle of diet 7Up on my first ride here led to a very uncomfortable few hours! Fortunately there’s an alternative flat orange flavoured drink. It’s loaded with sugar though so has become a fluid carb source for me as well as a means of hydration. I was going to write more on fat burning in general and the adaptations for endurance, but for now there’s a good article as part of the diet series over on The Science of Sport. That’ll do for now. Having got my swim out the way first thing I’m relaxing this morning (in MacDonalds for the wifi access), but I’ll be out for a bike and a run this afternoon. I don’t want it too easy!